Dr Perl Junior 9mm Pipe Filters 1 box containing 100 filters. Concave Drop In Steel Bowl Gauze Jumbo. Stanwell 9 mm Active Charcoal Pipe Filters Pack of 40 Unused. Condition is New. Dispatched with Royal Mail 2nd Class. Known by many as the Rolex of Smoking Pipes, the Roor Blue Series allows the user to gain a knowledge for the Superior product that is Roor but at a price point that won't break the bank. These roor bongs are long lasting, strong and very well made. Pipe Screens Gauzes in Gold Colour. Wire Gauze for use in G pro. 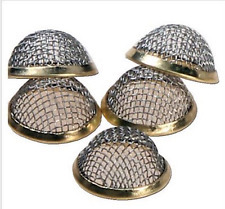 5x12mm, Pipe Screens Gauze Conical Steel Bowl Metal Gold.